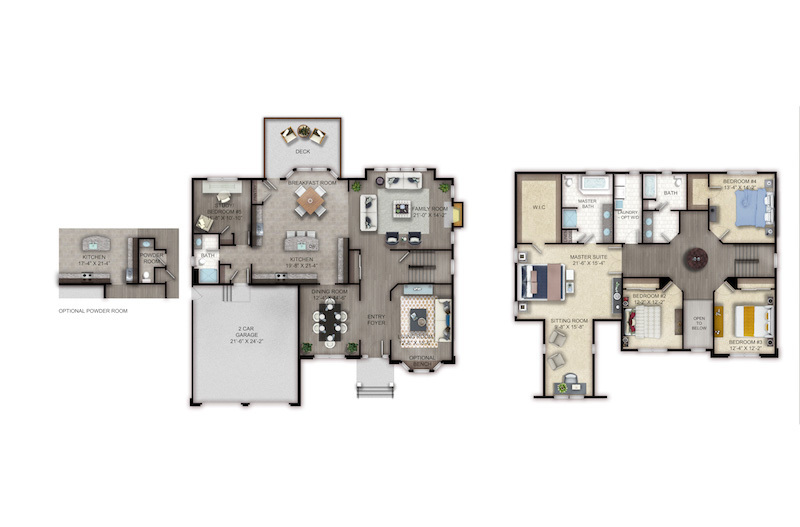 The single-family residences at The Reserve at Woodhaven present distinctive luxury in remarkably spacious floor plans ranging in size from four to six bedrooms. Each home promises to delight with its large kitchen and separate breakfast room, sumptuous master bedroom, downstairs den/bedroom with an adjacent full bath, ample bedrooms and lavish bathrooms. 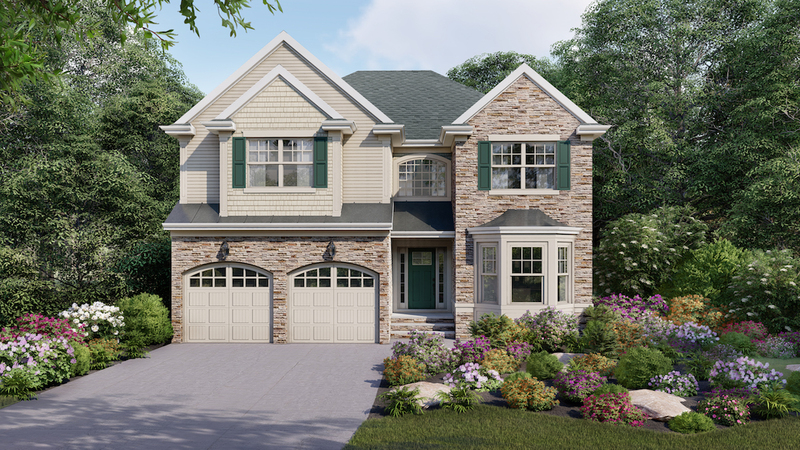 These impressive spaces and impeccable features are complemented by a double-height foyer, family room fireplace, stately exterior finishes, an inviting patio or deck, and paver driveway. The Reserve consists of just 32 landscaped home sites, the majority of which will remain wooded. When completed, the enclave’s streets will be lined with planted trees, Belgian block curbing and concrete sidewalks. Situated on the threshold of New York City and the Jersey Shore, The Reserve’s location provides outstanding convenience. 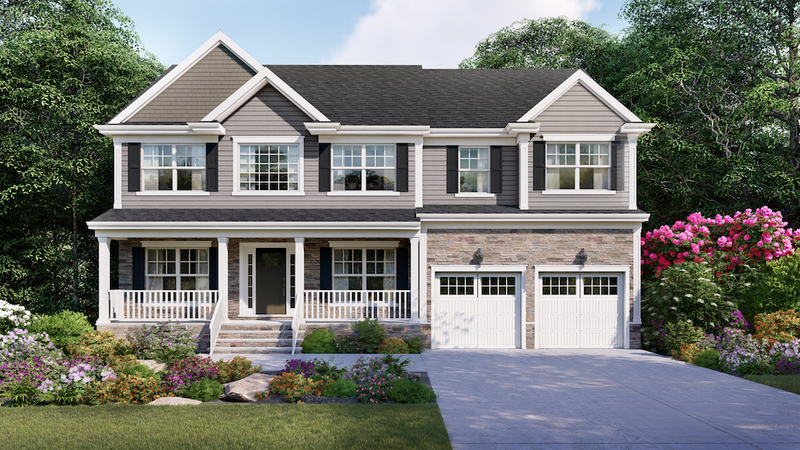 For all its tranquil surroundings, the enclave is easily accessible to major highways, NJ Transit, abundant shopping, excellent healthcare, diverse recreation and more. 4+ bedrooms | 3 baths | 3,669 sq. ft. The Matisse boasts majestic curb appeal in tandem with nearly 3,700 sprawling square feet of living space to create a home of exceptional luxury. A soaring two-story foyer greets you upon arrival, with the home’s large dining room and living room positioned on either side of the grand entrance. Continue on to a stunningly wide-open entertainment suite featuring a large eat-in kitchen with abundant cabinetry, a breakfast room with a bay window, and a window-laden family room accentuated by a stately fireplace. Nestled beyond the kitchen, a den/fifth bedroom is a private sanctuary from the home’s main living space. 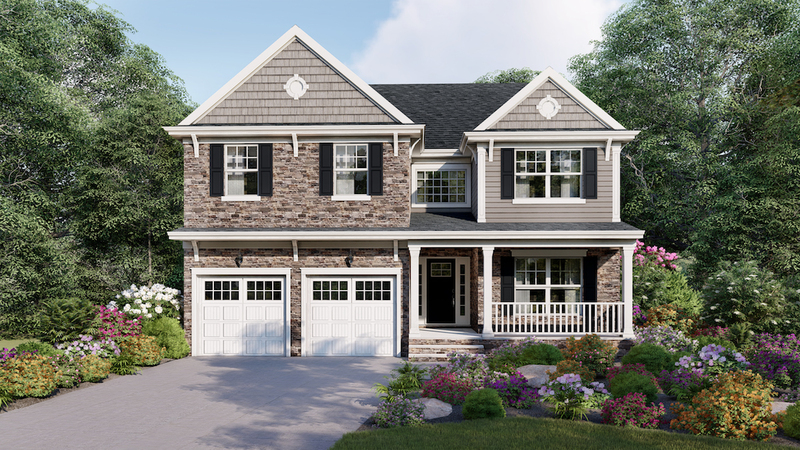 Upstairs, a large landing ushers you to two spacious bathrooms and the sumptuous master suite with its generously-sized walk-in closet and sitting room – privately sequestered beyond a double-door entrance. A laundry room, including a full laundry tub, complete the expansive second-story layout. The Matisse includes an unfinished basement (a walk-out, if the lot accommodates one). If not, a spacious deck off the breakfast room is included as standard. 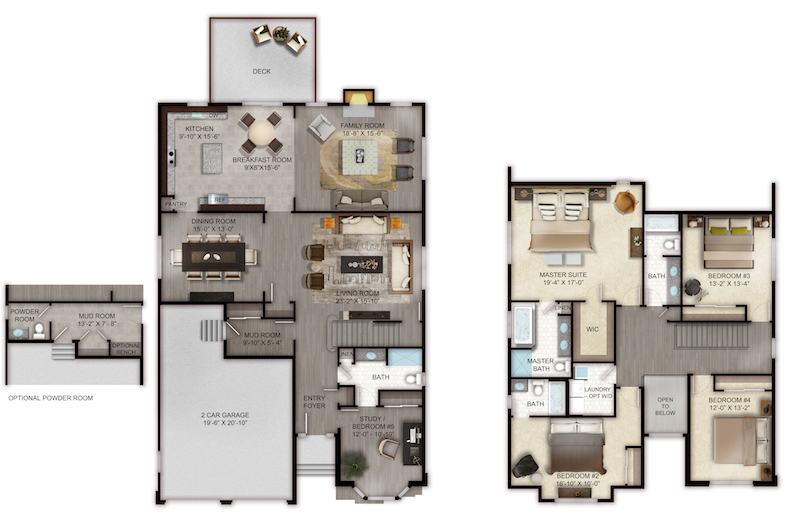 4+ bedrooms | 4 baths | 3,330 sq. ft.
Smartly designed throughout its 3,300 sq. 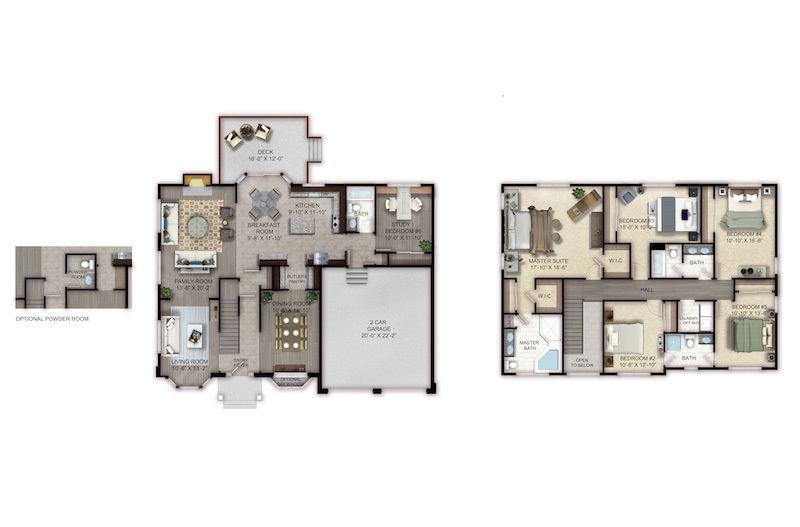 ft. floorplan, The Stanton is the ideal choice for those who wish to be pampered by a lifestyle of exquisite surroundings. 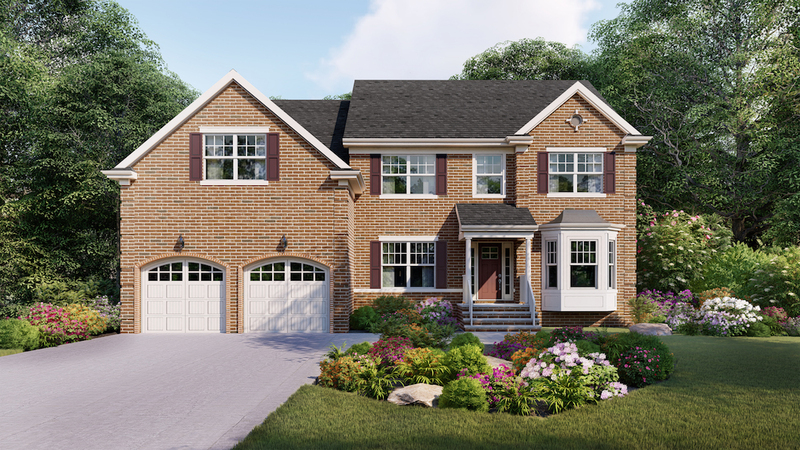 The Stanton’s recessed entrance opens into a stunning two-story foyer with access to a private study/fifth bedroom showcasing an en suite bath. The center of the house leads to the spacious living room and dining room, as well as a convenient mudroom with built-in storage space. At the rear of the first floor, the jaw-dropping entertaining suite comprises a beautiful island kitchen, large breakfast room, and expansive family room with fireplace. 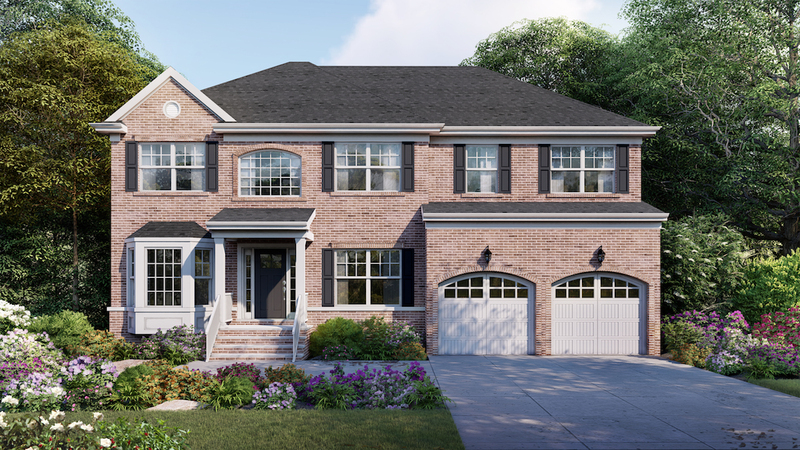 Ascend the stairs to discover the home’s remarkably spacious private level, anchored on each corner by four large bedrooms, including the elegant master suite with its master bath and walk-in closet. The second bedroom has its own private bath, while the remaining two bedrooms share a fourth full bath. The home’s discreetly located laundry room features a full-size washer and dryer and convenient laundry sink. The Stanton includes an unfinished basement (a walk-out, if the lot accommodates one). If not, a spacious deck off the breakfast room is included as standard. 5+ bedrooms |4 baths | 2,976 sq. ft. 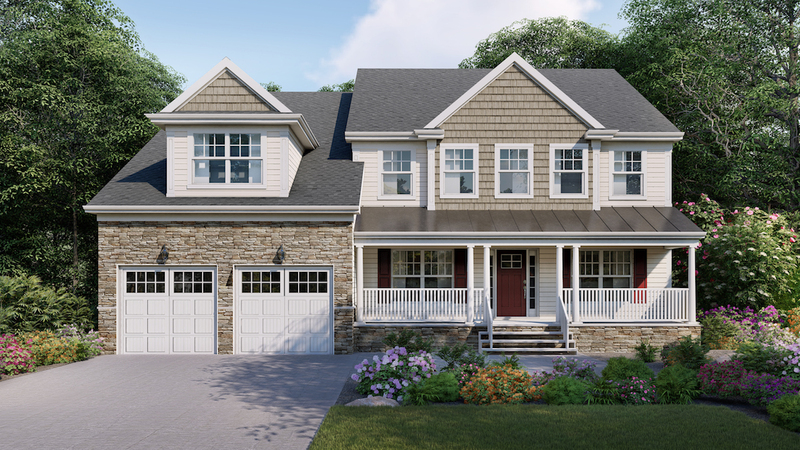 The 5-bedroom, 4-bath Paloma evokes sophisticated elegance with its thoughtfully designed, open floorplan and a choice of farmhouse or manor-style facades. Upon entering the two-story foyer, one is greeted by the exquisite living room, which leads to the spacious family room. Flowing seamlessly through this entertainment space is the stunning kitchen, complete with island, breakfast room and butler’s pantry. Just steps beyond the kitchen and full bathroom, a quiet retreat beckons— ideal for a home office/private study or additional bedroom. Upstairs, every square foot has been intelligently optimized to accommodate five bedrooms and three baths. At the top of the stairs, the master suite promises sanctuary with two walk-in closets and a luxurious master bath with a corner soaking tub. A hallway leads to the second story’s remaining four bedrooms and two baths. An upstairs laundry room completes this ingenious floorplan. The Paloma includes an unfinished basement (a walk-out, if the lot accommodates one). If not, a spacious deck off the breakfast room is included as standard. Second floor laundry room with hook-ups for washer and gas dryer.